Will you want to find a lasting and effective way for HEVC movie download? Will you want to get 100/200/300mb HEVC movies? 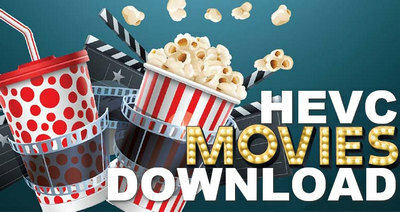 This article will share you how to download HEVC movies from online downloading sites and give you the list of upcoming Hollywood/Bollywood movies in 2019. Let’s keep going. HEVC is more advanced than H.264 in several ways, especially in the size of compressed files while keeping the same video quality. For example, if you download a full H264 movie with 2GB, you can get the same quality full H265 movie with 1GB. Therefore, downloading HEVC mobile movies will save a lot of space of your devices. This explains why the demand for “HEVC movies download” is getting higher and higher. What are the hottest Hollywood/Bollywood movies in 2019? This guide will share you a list of best new movies and introduce practical methods for HEVC movie download from YouTube, world4ufree and other video-sharing sites. Due to the length of this article, you can quickly reach the section you want to see. HD Video Converter Factory Pro is a HEVC movie downloader that allows you to download full HEVC Hollywood movies/Bollywood movies from YouTube, Facebook, Vimeo and more sites. Besides, you can convert HEVC movies to your devices that can support HEVC codec like iPhone, iPad, Android phone, etc. Tips: This article is only for technical research and we do not advocate illegal downloading of HEVC movies. For those of you who want to download movies from listed sites, please make sure that downloading online movies is legal in your country. Here we take movie4android as an example to tell you how to download HEVC mobile movies. Step 2: Click Category button to choose one movie category. You can free download HEVC mobile movies from Bollywood, Hollywood, South Hindi and 18+ in HD 720P, 1080P, 480P with 100MB, 200MB small size. 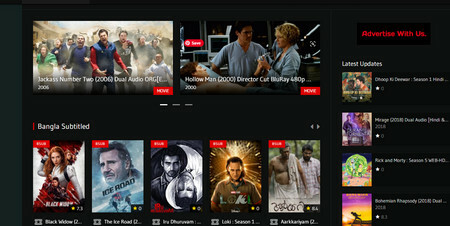 Step 3: Enter a new window to select your desired HEVC movie and click Download. Friendly tips: These online downloading sites may have the risk of disclosing personal information, or being compromised by viruses. When you download HEVC movies via these sites, please be sure to pay attention to network security. Actually, downloading HEVC mobile movies from YouTube is the safest way to go, but unfortunately, YouTube itself doesn't offer a download button. In this case, a free and useful YouTube downloader is a must-have. HD Video Converter Factory Pro is such a YouTube downloader that allows HEVC movies download. On the one hand, it can download HEVC mobile movies in 3GP/MP4/AVI and more video formats, on the other hand, it can compress the size of HEVC movies for saving space. Now, free downloadfree download this HEVC movie downloader to have a try! Go to YouTube official site and find your desired HEVC mobile movie, and copy its link like https://www.youtube.com/watch?v=59fDTCYaP6k (HEVC 700MB ShAaNiG). Free downloadFree download and launch HEVC movies downloader on your PC. Click “Download Video” button to enter a new window. Paste URL of HEVC movie to the Add URL box and then click “Analyze”. 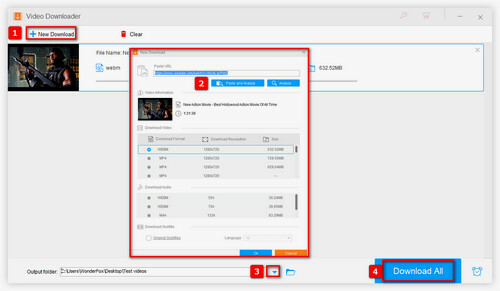 A few seconds later, the movie information will be automatically analyzed and you can select one desired output video format in the drop-down list. Set the output folder path and click “Download” to start to download full HEVC movies. Finally, you can find your downloaded movies in your destination folder. Although YouTube now supports HEVC upload, your downloaded movies are automatically changed to H264, in which case you can choose to convert downloaded movies to HEVC using HD Video Converter Factory Pro. Not only a HD mobile movies downloader, HD Video Converter Factory Pro is also a HEVC movie converter that can convert downloaded movies to HEVC. Just select the HEVC icon in Video table is OK! Download the software to try!